From giant pillow fights to a rock band of robots, check out this weeks weirdest and most wonderful photos. Now THIS looks like fun! 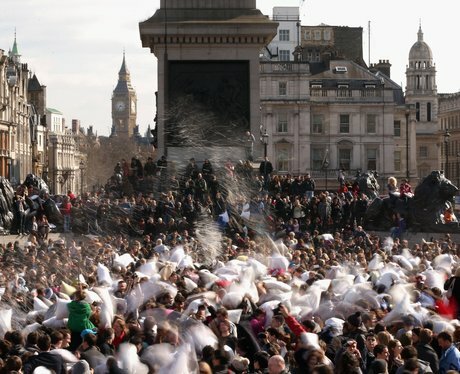 On Saturday April 6th revellers all over the world took part in International Pillow Fight Day. People in cities from Rome, to Hong Kong, to London grabbed a pillow and joined in the fun! Feathers were flying everywhere in Trafalgar Square as people took to the streets armed with their pillows. The amazing spectacle was part of the 'Urban Playground Movement', which promotes free events for everyone. A snowboarder glides down the water holding a boombox, as part of 'Californication 6.0', an event in Germany which celebrates the end of winter. Germany has always been known for its love of rock music, but one band are taking things to the next level: the band members are robots! The musical group's name is Compressorhead, and they apparently enjoy rocking out with their guitars in their spare time. Looking good ladies! These models are making us feel all summery as they pose for a group shot at Australia Spring/Summer Fashion Week 2013/14. Can we grab a ride? Designer Bottega Conticelli shows us the true meaning of riding in style at Milan Design Week 2013. Now that's what we call funky hair! A model get some wacky hair styling backstage at Australian Fashion Week. A renowned Japanese artist known for his classic Japanese animation has released his debut film Jellyfish. The film follows little Masashi as he starts his new school where each pupil gets their own remote-controlled 'friend' and cleverly blends computer animation and real life acting. I'm ready for my close-up! A model pulls funny faces in a fabulous bright pink wig backstage at Mercedes-Benz Fashion Week. And the award for the coolest car we've ever seen goes to (drum roll please)... Ross Lovegrove. The designer, seen here inside the purple showcase car, created the automobile for Renault. It was all fun and games at Milan Design Week. Anyone up for a game of giant noughts and crosses? This model brought a splash of colour at Australian Fashion Week Spring/Summer 2013/2014. The one important message to take away from Milan's 2013 Design Week is: all you need is love. We couldn't have put it better. Yes, this chandelier's would definitely fit in our hallway. A visitor gazes up at the stunning light creation. Visitors get lost in a colourful maze at this year's Milan Design Week. This old Mini brings a whole new meaning to Driving Miss Daisy. Visitors marvel at the beautiful light techniques used to recreate an underwater experience at Milan Design Week.